YOU HAVE TO ADMIRE the audacity of the attempt to build a road through San Gabriel Canyon connecting Azusa, in the San Gabriel Valley, to Wrightwood, high in the rugged San Gabriel Mountains. The planned route, along the East Fork of Southern California's San Gabriel River, passing beneath the immense west and north faces of Iron Mountain and up the dramatic narrows of the East Fork canyon, would have cut through the very heart of the San Gabriels. All they had to do to realize their dream was build it. The resulting highway would surely have ranked among America's most scenic, a feat not only of engineering, but also beauty. And it would have shaved hours off the drive from the city to the Wrightwood-area resorts. Even today, to drive from Los Angeles to Wrightwood you must choose from one of two lengthy options: either traversing or circumnavigating essentially the entire San Gabriel Mountain Range. The absolute necessity of a more direct route is debatable. But there can be no doubt the road would have perfectly fit the then-booming public recreational interest in the San Gabriel Mountains. And so, work began on the East Fork Road project in the late 1920's, achieving its proudest moment with the completion in 1936 of a state-of-the-art bridge in the canyon's narrows. Two years later, winter storm floodwaters utterly destroyed the road, leaving only the bridge as a reminder of the folly of the attempt. The 'Bridge to Nowhere' still stands today, in remarkably unblemished condition, and its name could hardly be more apt. The bridge sits isolated in a steep gorge beneath Iron Mountain, and it takes more than a little imagination to picture how possibly a road could be connected to it from either direction. 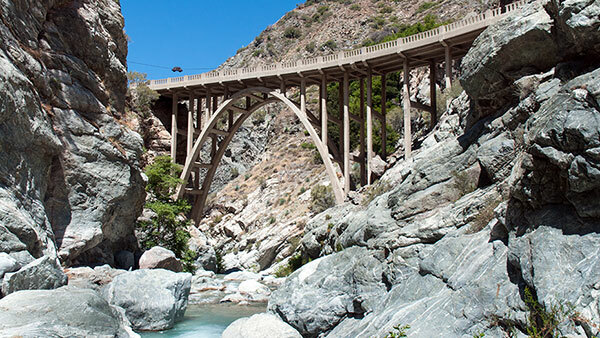 Driving to the bridge may be impossible today, but hiking to it requires only a modest 4.5 mile stroll from Heaton Flat along and across the cool waters of the East Fork of the San Gabriel River. The combination of quick metro access, varied and breathtaking scenery, and countless fine swimming pools is alone enough to place this among the upper ranks of Southern California day hikes. And then there is the main attraction: the Bridge itself. When you do reach the Bridge to Nowhere, you may find the sight of it both inspiring and tragic. It's hard to avoid contemplating the collision between grand dreams and nature that took place here—and the inevitability, perhaps, of the outcome.